Are you seeing OWLS? Everywhere? Thanks to social media, owls are as ubiquitous as were Pet Rocks back in 1975. I first became aware of the owl popularity on Pinterest when a family member created a Collect.Owls board. FYI: we are related. So, now, I too am ‘seeing owls’, and not just as Pins. A shopping trip for a birthday gift for said relative revealed a plethora of owl-related merchandise. 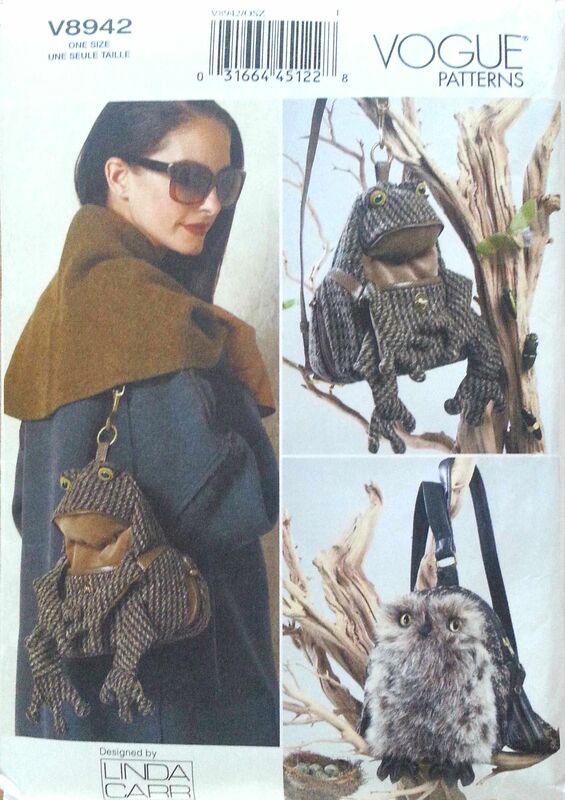 Which brings me to a Fall 2013 Vogue pattern release, V8942, a kooky, trendy backpack. Certainly not my thing but a fun item to make as a gift, which I did. Apparently, not everyone agrees this is an appropriate pattern, especially for Vogue. The exact quote is: “Oh god, I just noticed that there is a nest with eggs in the background of the owl picture. I’M DYING.” Hey, at least samples are made in subdued fabrics. I expect a lot of ‘someones’ are out there gleefully stitching this up in pink and purple. No accounting for taste! That being said, this is a pricey pattern ($27.50 US) and requires many notions and bits of fabric. The zippers alone can run up to $10-15 (3) depending on style. Wouldn’t recommend going for plain black teeth zips as the zips are what give pizazz. See pattern review for more information. Here are the results; a challenging, fun project and worth the look on the giftees face when this turned up under the tree. This entry was posted in FIBER ARTS and tagged backpack, owl, pattern review, Vogue 8942. Bookmark the permalink. However, I’m glad you left off the egg-filled nest for your version 😉 ha!